Realms of Magic :: New Magic Schools! Patch 0.6 has arrived! New Magic Schools! Patch 0.6 has arrived! To Brave Warriors and Mighty Mages of The Old Kingdom! Our tormented and dangerous lands seek for an immediate rescue. Are your ready to bring them help with new great Tools of Destruction? Come back to the old realms and prove your skills to unjust World! The long-awaited Patch 0.6 arrived today. New features and improvements are mostly focused on gameplay experience and new opportunities of combat style preferences during your adventures. We truly believe that our work and ideas will meet your expectations and reward your patience. Please find detailed list of changes below. Let’s get started! Each Magic School has its own skill tree requiring about 40 talent points to max it out. Talent points can be spent on learning new spells and passive magic abilities. Nothing stands in your way to try a different builds and make mixes among them. As always - play it your way! Ice Spike works like ice missile. Cold Wave - cone shape freezing breath. Ice Nova shoots ice spikes from the both sides of a caster which toss hit creatures in the air. Ice Barrier blocks and reflects incoming damage. Deep Freeze is a stacking debuff spell. Each next stack slows enemies actions. Summon Rat - summons a rat companion. Summon Wolf - summons a wolf companion which can additionally cause bleeding on enemies. Summon Boar - summons a boar companion which can additionally slow enemies. Regenerate - AOE buff which increases health regeneration for all allies. Stone Skin - AOE buff which increases armor for all allies. Necromancy is forbidden dark magic of death. Use 4 deadly spells to devastate your enemies. Dread Bolt - deadly ghost missile that pierces enemies bodies. Causes damage to the opponents and makes them more vulnerable for incoming hits. Summon Skeleton - raises undead who will fight for you. You can summon skeleton warriors and mages. Summon Ghoul - summons fast and deadly Ghouls. Grim Wind - AOE debuff which inflicts damage over time. It heals caster for percentage of caused damage. New Animation for: walking, jogging, running, jumping, rolling, falling, punching, weapon drawing, shield holding, shield blocking, spell casting, eating and drinking. Added weapon trails while attacking and preparing to attack. 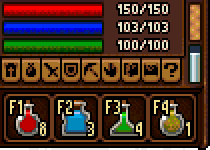 Combat skills does different colors which depends on used strength and attack speed. Visual damage system has been improved. It is more responsive and satisfying when hitting an enemies. We have added blood on hit which made combat more attractive and juicy. Added 4 slots Active Bar which can be used anytime during gameplay. You can put in every potion, food, book and much more. Almost every “useable” item in game. Action Bar slots are activated by pressing F1 - F4 on your keyboard. Upon Level Up your character will explode with powerful energy which will cause damage and knockback enemies. It will also fully restore your health, mana and stamina. We fixed many bugs and issues that were found mostly by our beta testers. Next Patch will be focused on New Content and Randomly Generated Locations. New content items, armors, weapons, enemies, crafting recipes and so on will be also implemented in Patch 0.7. We can’t wait to hear your feedback! Please let us know your thoughts about new changes in Realms of Magic! We are humbly thankful for your support and all the kind words. As always stay Awesome Guys! Its good to have new spells, but please fix crash when spamming magic. So frustrated I have to save every time when fighting to prevent data lost. A sale would be nice. I mean, an actual discount - 10% off is nothing. Very nice! BUT!........I am still waiting for archery. Bows and Crossbows C'mon! Wszystko fajnie ale dajcie nam w końcu przetestować grę w ojczystym języku! Ile można czekać? Wielu moich znajomych nie kupuję jej ze względu na to że nadal nie ma polskiego..
can't wait to try these changes! thanks guys!